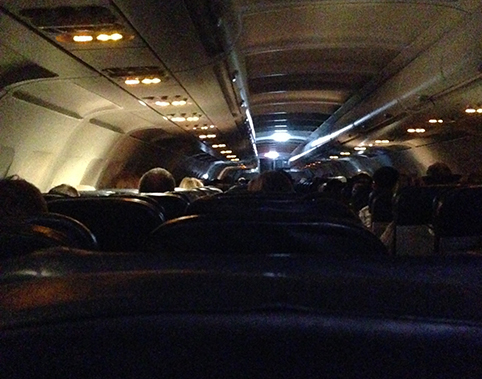 There we were in the plane, which was shaking violently in what should have been a standard landing. The turbulence was as bad as anything I had felt before as the storm was blowing up around us. Then I saw something that really caught my attention. A thing that I had never seen on a plane before… The emergency exit lights…ON, showing us where to escape in the case of a crash landing… What?! Now that got my attention. This was serious. Crash landings are not known for their success rate, as far as I understand anyway. That Billy Connolly joke always comes to mind where he reminds us that we never hear in the news ‘a plane crashed into the side of a mountain, fortunately all the passengers were wearing their safety belts’. So I was thinking ‘this could be serious’. My thoughts and feelings are pretty consistent in these uncertain moments. I usually communicate with my understanding of the Divine and just say ‘thank you’. Strangely I do not plead for my safety, as I know that many before me in that situation might have looked for an extended life, in vain. While I do have faith in a higher power that is way beyond our comprehension, I choose graceful acceptance in those moments. I am not saying miracles don’t happen, they do. We exist and that is a miracle. But for me, the miracle of spirituality is an escape act from the prison of self, not from physical death. No matter what your understanding of life or the hereafter, some serious thoughts will go through your mind in this sort of situation. What do you say to yourself in such circumstances? For me, having lost both of my parents relatively early on in life, the whole life/death mystery has been well visited. However when it is potentially your own impending death, you have much to think about. Surely evaluating your life comes into the thought process. Well although I have much planned, yet to be achieved, my focus is on whether I was a good person rather than notoriety or wealth. I believe that while we all have different models of faith, different ceremonies and cultures, ultimately our purpose here is to purify our hearts through thoughts and acts of goodness and like a polished mirror, they will reflect spiritual virtues like love, compassion, tolerance or even yang/hard virtues like discipline. As we fortify ourselves with these spiritual vitamins we feel more fulfilled and mature in life. We become more useful to humanity also. These qualities truly cannot be developed in isolation. For example you may think that you are patient until you have to deal with another human being. Then you find out where you are really at. For me, nurturing those qualities is like a child in the womb developing its limbs. It may not need them yet, but when it enters the world it will find these limbs to be very useful. So my understanding of heaven or hell is one of mere metaphor. If we develop higher qualities we draw nearer to the light, If not, we will be more distant and at a loss, underdeveloped as it were. The idea of ‘being good’ and forgoing pleasure in this life for a huge reward in the next life is a bit narrow in perspective for me. If you live a life loving and serving people out of gratitude for your existence, surely that is a more detached form of spirituality. Whatever comes to us then, comes. Our concept of the Source of life is only constructed in a way that our puny minds can comprehend in any case. We struggle enough with the reality that even though we may have a spiritual source, we evolved in a universe that contains millions of galaxies. So rather than getting lost in space or fight over differing theologies, all we can really do is be the very best we can be, recognise what elevates us and to work together to build a fairer more loving world. So rather than me thinking ‘did I do enough to be saved or go to heaven ?’ I just say ‘thank you’ and allow whatever the next stage is to be what it is. (and then brace myself 🙂 ). It certainly made me even more driven to get my life mission sorted sooner rather than later. How about you? What are your thoughts in those moments, when you think you’ve just heard your number being called? What is life and death to you ? However long you do stick around, make sure to live while you are here. Very inspiring message Paddy. Great questions to reflect on. I am glad you shared your close call. Also glad that you made it! Love your image/metaphor about being in the womb and developing our limbs for when we need then later in life. Keep it coming, great article.